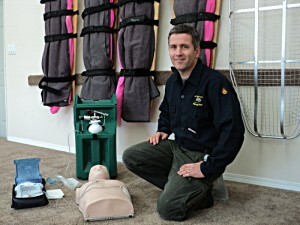 The requirement for Trained First Aid personnel and specific First Aid Equipment and Vehicles is outlined by WorkSafe BC for different job sites throughout every industry in BC to meet Occupational Health and Safety guidelines. Strategic Fire Control provides services and equipment to meet those needs in the field. Our personnel are trained and certified with the appropriate levels of First Aid Training, and our Emergency Transport Vehicle (ETV) and Mobile Treatment Centers (MTC) are fully stocked with up to date First Aid Equipment to meet or exceed the WorkSafe BC requirements for job sites. Strategic Fire Control also provides First Aid Vehicles staffed by Class 4 Drivers and Level 3 First Aid Attendants to the BC Wildfire Service on an annual basis during the busy forest fire seasons. We provide treatment to areas in need of habitat restoration of both plant and animal species as identified by wildlife biologists and registered professional foresters. We have completed projects for not-for profit organizations and for the BC government with treatment that has included Forest Health Surveys, Juvenile Spacing, Brushing, Slashing, Falling, Chipping, Pile Burning, Controlled Burns and Pruning. Strategic began providing Fire Suppression services in 1994 to the BC provincial government. Strategic has since provided Wildland Fire Suppression to the Alberta government and Parks Canada on an as needed basis in busy forest fire seasons. Structure Protection Crews: Since 2003, Strategic has been involved in working with the BC government to have crews working on site preparation and structure protection in areas where a forest fire looks to interface with structures, homes and community values to prevent forest fires from being catastrophic to those structures. Structure Protection Unit Trailer: Strategic has a fully stocked Type II Structure Protection Trailer that can be deployed to fires around BC in order to assist with equipment requirements for Structure Protection Crews in protecting assets in the Wildland Urban Interface zones. (photo coming soon).